Purchase any Dutch Lady dan/atau Friso® Gold products in a single receipt with the purchase of RM60 and above from any participating product entitles the participant to 1 SMS entry. 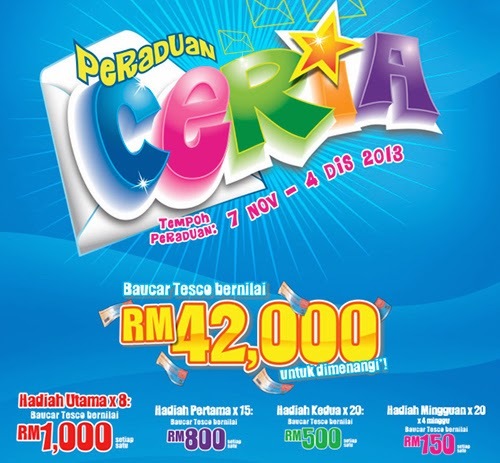 Answer a simple question: "Ceria Dutch Lady" Contest is exclusive for Tesco customers only. True or False. Type "DLTESCO<space>date of receipt DDMMYY<space>15 digit Tesco receipt number<space>total amount for Dutch Lady and/or Friso® Gold products RM00.00<space>12 digit IC number<space>answer to question<space>name" and SMS to 32632. Retain original sales receipt with matching Tesco receipt number and receipt amount as the SMS entry as proof of purchase.